Utkatasana's name comes from the Sanskrit utkata, which means “fierce, proud, high, haughty, superior, immense, large, difficult”—you get the idea. This pose is often called “chair pose” in English because it looks as if you are sitting in an invisible chair. But this is no easy chair; it's more like a throne. Utkatasana's name comes from the Sanskrit utkata, which means “fierce, proud, high, haughty, superior, immense, large, difficult." Historically in India, chairs were uncommon; most people sat on the floor or the ground. Royal people, kings and queens, sat on elevated chairs, or thrones, which raised them above the common level and made them more easily visible for darshan—that act of seeing and being seen which unites a king or deity with the people. The Ramayana, the tale of Lord Rama's exile, adventures, and ultimate return to his kingdom of Ayodhya, is, in a sense, a story about a chair or throne. The action begins when Rama's stepmother Queen Kaikeyi—who once saved her husband's life on the battlefield and was thus granted three boons (or two boons, depending on which version of the story you follow)—demands that Rama, the intended successor, not be made king, that her son Bharata be crowned king instead, and that Rama go into exile for fourteen years. But Rama's brother Bharata refused to occupy the throne which he knew he did not deserve. Instead, he placed a pair of Rama's sandals on the royal seat to emphasize the absence of their owner. Indian philosophy identifies several specific sorts of absence. Antyatabhavam refers to the absence of something that has always been in a particular location, should be there, but is not there now. Its absence is palpable. For example: Say that I always keep a pencil on my desk, but when I look for the pencil, it's gone. I know I left it right there. Did it roll away? Did someone take it? It couldn't have just disappeared. Its absence itself then is a kind of presence. In this place where my pencil should be, there is nothing. Rama's sandals on the throne express this kind of absence. The sandals sent the message: The real king, Rama, is absent; I will do my best as his placeholder. A throne is more than an imposing piece of furniture. Symbolically, it conveys the power and authority of the one who sits on it. A ruler's decisions affect everyone in his kingdom, so the person who occupies the throne had better be wise, just, and prepared to renounce his personal agenda in favor of dharma, the divine order that sustains life and the universe itself. A worthy ruler, a dharma raja, must protect and serve his people in accordance with dharma. And this is a huge responsibility. Everyone in Ayodhya, except Kaikeyi with her distorted thinking, knew that Rama was the best possible person to be king. When Bharata placed Rama's sandals on the throne instead of sitting on it himself, he dramatized his own position as someone who was not worthy to fill those shoes. The sandals sent the message: The real king, Rama, is absent; I will do my best as his placeholder. Stand straight, with your feet slightly wider than hip­-width apart. Inhale, lift your arms alongside your ears. Lift your shoulder blades and rib cage along with your arms to avoid creating tension in your neck and shoulders. Stretch your elbows straight; keep your wrists and fingers long and easy. Imagine your arms extending from the center of your waist to your fingertips. Exhale, bend your knees, and move the tops of your thighs back. Your knees will extend beyond your ankles. Lift your rib cage until it is as nearly vertical as it will go while still keeping your knees bent. Release the top rim of your buttocks down. You will resemble someone sitting in a chair and leaning slightly forward. Draw your low belly in and up. Let the front body support the back body. Keep your front ribs parallel with your back ribs; don't poke them forward or arch your lumbar spine in the attempt to lift your chest. Balance the lift of your chest by extending a long, imaginary tail along the floor behind you. Keeping the back of your neck long, lift the base of your skull and the crown of your head—as if you were wearing a crown. Keep your eyes calm and your forehead broad. Occupy your throne with attention and poise, even though the pose requires effort. Check your eyes, jaw, and tongue for tension. Release any held tension on your out breath. Stay in the pose, breathing quietly, for ten breaths. To come out of the pose, exhale, lower your arms, and straighten your legs. If you are restricted in lifting your arms fully, take the heels of your hands to the very tops of your thighs and press down. Imagine the tops of your thighbones connecting with your heels. Lift your spine and rib cage. Roll the skin over your collarbones up, over your shoulders, and down your back. Imagine the tops of your thighbones connecting with your heels. You can fine-­tune the leg action in this pose by squeezing a block between your thighs, or by practicing against a wall. Stand with your back at the wall and heels on the baseboard. Take the heel of one foot to the toes of the other. Now bring the back foot level with the front foot, hip-width apart. Keeping your hips on the wall, bend your knees. Lift your arms and draw your low belly strongly back and up. Press your feet into the floor, press your hips into the wall and descend the tops of your thighbones toward your heels. Find the tension, the balance, of working your legs powerfully and stably as you lift through the crown of your head. Where is the ease in this pose? Where is the poise? Notice your breath and the quality of hardness or softness in your eyes. Are you ready to sit on this throne? Health benefits of chair pose include strengthening the legs and ankles, stretching the chest and shoulders, and stimulating the abdominal organs and heart. Chair pose is quite stimulating, so don't practice it just before bed, especially if you have trouble sleeping. It is also warming, making it a great choice for cold winter mornings! Have you ever been in a position to assume responsibility greater than you felt prepared to handle? Have you ever been in a position to assume responsibility greater than you felt prepared to handle? Like Bharata, you may have been called upon to take a job that you believed would be better filled by someone else—and yet you were the one who had to do it. How did that feel? 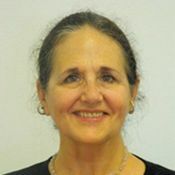 Did it, or might it help you to invoke the aid of some transpersonal authority or higher power? Imagine finding ease in the knowledge that you are not the doer but simply the placeholder for dharma, the one through whom a worthy purpose is accomplished. 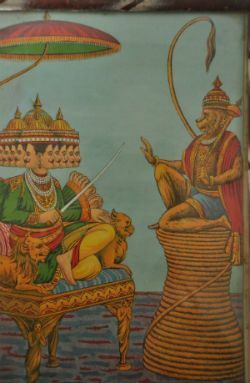 Another “throne” story from the Ramayana involves the monkey warrior­-hero Hanuman. In his quest to rescue the captive Queen Sita from the evil Ravana's clutches, Hanuman flies to Lanka where he is brought before Ravana. Ravana, the very incarnation of pride and ego, ascends his impressively high throne and gazes contemptuously down on Hanuman. Hanuman, ever-resourceful, uses his magical powers to make his tail grow…and grow…and grow, until its coils form a “throne” even higher than Ravana's! Hanuman's power and confidence were rooted in the knowledge that he was the servant and messenger of Rama, the most exemplary dharma raja of all. His faith in Rama gave him confidence in himself, just as Bharata's faith in Rama allowed him to rule in his absence. Remember a time when you drew confidence from your place in a venerable lineage and did your best to behave in a way that honored that lineage and teacher.